According to Philaelphia NBC 10's Judy Smith, Eagles' backup quarterback Michael Vick was denied traveling liberties and the ability to leave the state of Pennsylvania. Since the recent shooting at his 30th birthday party in Virginia Beach, V.A., Vick has been scheduled to be in Baltimore, Atlanta for his own golf tournament and a youth football camp in Raleigh, N.C., but has been forced to miss those events. Besides missing those events, Vick promised Cornelius Corprew, director of Camp Elite Sports' two-day football camp, on Saturday that he would be attending the camp. Vick received $2,000 upfront and would have received another $2,000 if he had showed up. Unfortunately for Corprew, a representative of Vick called him at 2 a.m. on Sunday morning to inform him that Vick was unable to make the event. "We're not crazy," Corprew said. "No state agency is communicating at 2 o'clock in the morning that he's not allowed to come. I think that was a selfish act. "I'm upset because our camp is built on integrity and character and that's what we teach to our kids." For Vick, the only way he has been able to travel since being released from prison was at the discretion of his probation officer. This means Vick knew he probably would not be able to make the football camp when Corprew came calling on Saturday. Furthermore, an ESPN report says the reason Vick was a no-show for the charity golf event was due to a "team meeting" with the Eagles. As for Vick's current situation with the Eagles, he is allowed to travel with the club to training camp on July 29 since the camp is held at Lehigh University in Bethlehem, Pa. (60 miles north of Philadelphia). However, it is unknown whether Vick will be able to travel with the team for road games, which would severely affect his ability to play for the Eagles. Of course, his probation officer might make an exception for Vick since it is for "work purposes." So far the Eagles have had no official response, but Yahoo! Sports is still reporting that a high-ranking Eagles sources said releasing Vick is a viable and “absolutely” an option. Still, the Eagles are beginning to look like fools for continuously overlooking Vick's indiscretions. While Vick is a talented player that helps the club, but what good is he to a team if his probation officer will only allow him to play home games? Moreover, how can the Eagles expect Vick to be a pivotal cog on their squad if they cannot trust him to keep his nose clean or to be telling the truth? 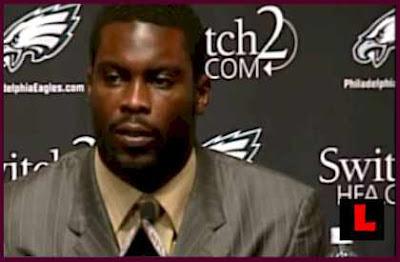 Originally, Vick plead that he had nothing to do with the shooting and left hours before that incident. Since then, it has come out that he lied to the police about when he left Club Guadalajara and evidence revealed that he had a been part of a confrontation at the nightclub. Maybe Vick did not do anything to be found guilty, but it is apparent he has not learned his lesson about lying. A team cannot have a question mark at the backup quarterback position. More importantly, they definitely cannot have a teammate that they cannot count on or trust to be there on Sundays. Without a doubt, Vick is a significant toy in Andy Reid's bag of gadgets, but it is becoming more and more obvious that Jeff Garcia should be on speed dial for the Eagles. I think the Eagles need to stay on the probation officers good side. All kidding aside I think it is a non-issue, he will be allowed to travel to road games unless he does something so stupid he is under house arrest or back in jail. Still it would be smart to have plans a through d ready to go. WIFES LOVE TO GO OUT!! SO HE CAN'T GO OUT TO HIS OWN BIRTHDAY PARTY WITH HIS WIFE????? WOW!!!!! I GUESS VICK CAN'T HAVE A FAMILY REUNION AT HOME EITHER!!!!! Somehow I feel like this is exactly what Quanis Phillips was trying to do. Other than get shot. Vick left the party before his cousin, Quanis Philips, was shot. That Oakland cop shot a kid in hand cuffs and you Krackers let him off. But Vick gets two years in the fed's on a first offense for some dogs?????? And now this. Wow!!! I DON'T THINK WHITE PEOPLE ARE THE DEVIL, BUT YOU WILL DO UNTIL THE REAL ONE GETS HERE!!! Jo you need to settle down and take the racial name calling out of this. Vick isn't being scrutinized so closely because of the color of his skin, he is because he was one of the richest players in the NFL three years ago before he made a bonehead move with those dogs. Unfortunately when you already have one felony conviction you are more of a suspect when a shooting goes down, that is just the way it is. Be honest with yourself someone who has a history of cruelty to dogs it is easy to make a connection to how they might be more inclined towards a violent act like a shooting. In the end I am cheering for him to make a real come back like I think a lot of people are. I can not wait for training camp to begin and some of this other stuff to fade to black.